Prof Asit K. Biswas is universally acknowledged as one of the world’s leading authorities on water, environment and development-related issues. He has had a very distinguished career as an academic; senior public official in Canada; advisor and/or confidant to Presidents, Prime Ministers and Ministers in 19 countries, six Heads of United Nations Agencies, two Secretary-Generals of OECD, several Heads of bilateral aid agencies, and four CEOs or Chairmen of MNCs that are within the first 100 of Fortune 500 list. He has worked and lived in all continents except Australia. He was a member of the World Commission on Water and co-founder of International Water Resources Association and World Water Council. He helped to establish the United Nations Environment Programme (UNEP) in Nairobi and natural resources programme of the United Nations University in Tokyo. 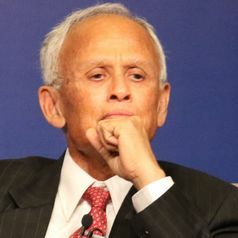 He was a member of the Global Agenda Council of the World Economic Forum and is currently member of the International Advisory Board, Pictet Asset Management, Geneva; member of the Advisory Board, Indian Institute of Technology, Kharagpur; and Strategic Advisor, Singapore International Water Week. He is also a Visiting Professor at Chinese Academy of Sciences. Among his numerous awards are Stockholm Water Prize, considered to be the Nobel Prize for water, for “his outstanding and multi-faceted contributions to global water resource issues”; Crystal Drop and Millennium Prizes of the International Water Resources Association, and Walter Huber Prize of the American Society of Civil Engineering. He has also received the “Person of the Year” award from Prime Minister Harper of Canada; Aragon Environment Prize of Spain; and seven honorary doctorates of science, engineering or technology from leading global universities. Reuters named him as “one of the top 10 water trailblazers of the world,” and Impeller magazine selected him as “true global water hero.” He was voted as the “world’s second most influential water industry leader” by the readers of Water and Wastewater International of UK. He was elected an Academician over 20 years ago. He currently has an h-index of 41. In early 2019, Google Scholar listed 944 of his publications and over 8,432 citations of his work. He has a Research Gate score of 41.67, which puts him into the top 2.5% of all scientists from all disciplines from the entire world. He is the author or editor of 88 books. His work has been translated into 41 languages. Prof Biswas is the founder of the International Journal of Water Resources Development and was its Editor-in-Chief for its first 29 years. He is a regular media commentator in BBC, CNN, CNBC, TRT, Channel News Asia and MediaCorp on issues related to natural resources management, environment, international affairs, business strategies and impacts of future scientific and technological innovations on society. His opinion pieces in various international media are now being read by some 3.1 million readers annually. Prof Biswas received Stockholm Water Prize in 2006, for his ‘outstanding and multifaceted contributions to global water resources issues.’ This Prize is unanimously considered to be the Nobel Prize for Water. He has received all the major awards of the International Water Resources Association, including Crystal Drop Award, Millennium Award and Ven Te Chow Award. Among his numerous other honours are seven honorary doctorates from world’s leading universities and Aragon Environment Prize.